In the tradition of A Civil Action and Erin Brockovitch, Class Action is a story of intrigue and injustice as dramatic as fiction, but all the more poignant because it is true. 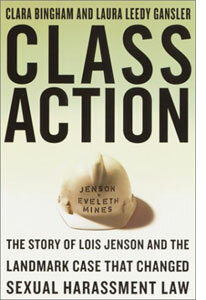 Jenson v. Eveleth Mines, the first sexual harassment class action in America, permanently changed the legal landscape, as well as the lives of the women who fought the battle. In the coldest reaches of northern Minnesota, a group of women endured a shocking degree of sexual harassment--until one of them stepped forward and sued the company that had turned a blind eye to their pleas for help. In 1975, Lois Jenson, a single mother on welfare, heard that the local iron mine had begun hiring women. The hours were grueling but the pay was astonishingly good, and Jenson didn't think twice before accepting a job cleaning viscous soot from enormous grinding machines. What she hadn't considered was that she was now entering a male-dominated, hard-drinking society that firmly believed that women belonged at home--a sentiment quickly born out in the relentless, brutal harassment of every woman who would work at the mine. When a group of men whistled at her walking into the plant, she didn't think much of it. When they began yelling obscenities at her, she was resilient. When one of them began stalking her, she got mad; when the mining company was unwilling to come to her defense, she got even. From Jenson's first day on the job, through three intensely humiliating trials, to the emotional day of settlement, it would take her twenty-five years and most of her physical and mental health to fight the battle with the mining company. With the help of Patricia Kosmach, the first miner to join the suit with Jenson, and her luck at finding perhaps the country�s finest legal team for class-action law, Jenson would eventually prevail, although at great emotional and economic cost.